Who doesn’t love a beautiful castle? That’s exactly what the Castle Dragon wants his enemies to think. This sneaky dragon is the master of disguise and doesn’t have to do much to lead his enemies into his trap! Once they’re inside, there’s virtually no escaping. Castle is not Currently Breedable. Sorry. 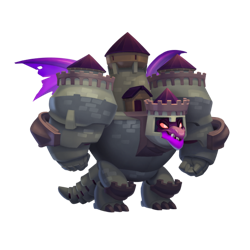 Castle is a Legend primary element dragon and so can only be critical hit by other Legends. Avoid using Physical based attacks against Castle as they will have a weak effect. To beat Castle use high category dragons with strong attacks, higher level, and/or lots of stars!